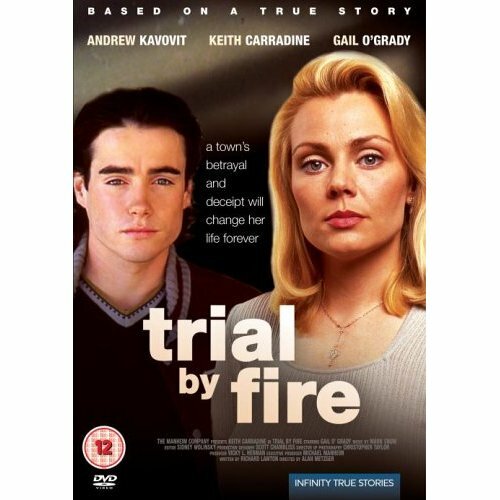 "Trial by Fire" is a TV movie drama / thriller, of 90 mn, realized in 1995 by Alan Metzger, inspired by real facts, redrawing the story of a young teacher who was accused of corruption of a minor after the suicide of one of her pupils, teenager. Sean is a teenager, Danny. This TV movie redraws with neatness the development of a rumour and the devastation which it causes. Without Manicheanism, he wonders about the function of teacher and the relations which can be formed between bosses and pupils, maintaining of the blow a double suspense, on the innocence or the fault of Paula, and on the motivations of her indicters. Flashsbacks, about which we know if they recover from the truth or the fantasies of the teenagers, maintains the illness. The psychological analysis is subtle and the end demiteinte: even if justice is returned, nothing will be more as before. Synopsis: Kip, a teenager, has just committed suicide. Very quickly, a rumour seizes this smart district of San Diego, in California: Kip was the lover of his professor of letters, Paulette Gill. At the origin of these rumours, the testimony of three companions of secondary school of Kip, Garrett, Paul and Stewart, who tell to have surprised Paulette and Kip during their cavort. Paulette is then going to live a real nightmare. The parents of her pupils raise themselves against her, Roger, her husband, too teaching, loses his work, his neighbours don't speak to her any more, presses her pursues it of the gossip and the prosecutor Earl Cleaver, setting up itself as defender of the morality, is incensed against her. Accused of corruption of a minor, she asks a renowned lawyer, Owen Turner, to assure her defence. He doesn't succeed in understanding why Garrett, Paul and Stewart accuse her, nor why the parents of the pupils, those of Kip in head, show such a vindication. It will be necessary for the subtle lawyer all its sharpness of analysis to sort out between the lies and the truth. Regrettably, no Sean's photo extracted from this TV movie.